This 18 room Rock Island house would be considered spectacular anywhere in the country – in fact it was described as the “most magnificent residence in the three cities” when it was completed in 1893. That’s not surprising, considering its reported cost of $50,000. That may not seem like a great deal of money today, but consider this: Old Lincoln School that stood at 7th Avenue and 22nd Street was completed the same year at a cost of $60,000. Extending those numbers into today’s dollars means the Rosenfield House would cost millions to build today, if indeed the skilled artisans could be found. Large mansions such as this are very vulnerable to demolition. Most of the big estate homes in Rock Island have been destroyed, either to build something else – from highways to commercial buildings — or because they were so neglected and abused that restoration was impossible. Sometimes they have been demolished for no good reason. How did it happen that Morris Rosenfield’s house still stands triumphantly, with its architectural and historical features intact? Many people and organizations, and federal law as well, are responsible. When Morris Rosenfield built his massive brick and stone house, he called it Spencer Place, because this was the original site of John Spencer’s home. Spencer, one of the first settlers and major landowners in Rock Island, had sited his small home at the head of 19th Street (it came to a dead end at his property) so he had a clear view all the way downtown. Rosenfield bought the land from Spencer’s estate in 1891. Mr. Rosenfield was born in Germany in 1841 and came to Rock Island as a young man in 1859, to join his uncles in a wholesale leather business. He made his fortune, however, by operating the Moline Wagon Company, a factory that made farm wagons. He was already elderly by the time his home was completed, and he would only live here 6 years until his death, which is why the postcard is identified as Mrs. Rosenfield’s residence. The wagon company was sold to Deere after Mrs. Rosenfield died in 1910. The mansion remained in the Rosenfield family for some years, with son Walter taking over ownership until the late teens, when he moved across 7th Avenue to what was known as the Buford House. Walter was president of Rock Island Bridge and Iron Works, and also served as mayor of Rock Island from 1923 – 27. Walter sold the house in 1916 to Martin Welch of Illinois Oil Company, who sold it again a few years later to St. Joseph’s Catholic Church for use as a convent. Forty years later, in 1958, the church built another convent and sold the mansion to the Tri-City Jewish Center for $85,000. 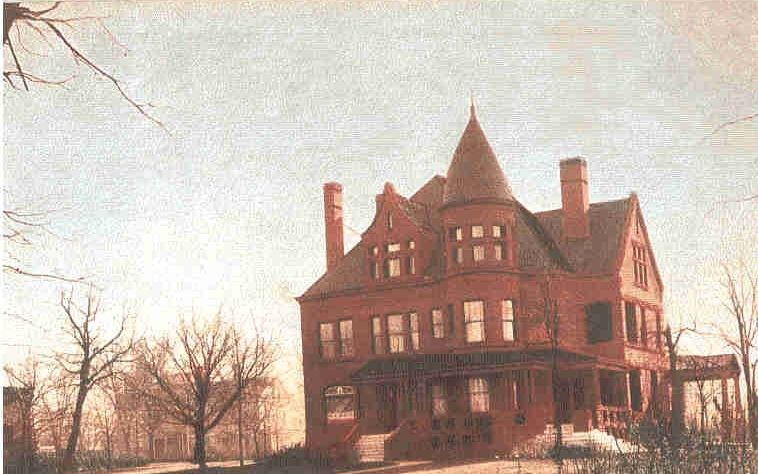 The Center already owned the Buford House across 7th Avenue and needed space for its educational center. When the Jewish Center purchased the property, it was saved from destruction. Rabbi Jordan Taxon said other potential buyers had been looking at the property to tear it down and build a motel or restaurant. When Rabbi Taxon led a reporter on a tour of the home, he noted how the nuns had taken loving care of the home. They had used the formal parlor, which had a fireplace of white tile with inlaid flowers, as a chapel. He also pointed out many details that would be restored – parquet floors, with each 10 inch square made of 14 kinds of wood; rooms paneled with hand carved squares of different woods; a parlor ceiling, with angels painted in oils. The Jewish Center continued the loving maintenance of the home, accommodating their educational use with minimal change. When a new Jewish Center was built on 30th Street in the late 1970s, Harris-Weber Ltd. of Northbrook, Illinois purchased this site to construct an 8-story senior citizen high rise. The Rosenfield Mansion was almost certainly doomed. But wait! To the rescue came a relatively new federal law! Anytime federal dollars were involved in a project, the project had to be reviewed for its impact on local historic resources. Since the high rise was largely funded by federal dollars, an evaluation of the mansion was mandated. Fortunately it was found to be eligible for the National Register of Historic Places (did we have any doubt?). Thus it could not be demolished if the developers hoped to keep the federal subsidy. While they could have chosen to finance the entire project on their own and proceed with demolition, they decided to restore the mansion for a senior center instead – and keep those federal dollars. That restoration was facilitated by the Rock Island City Council, who voted in 1980 to give $40,000 towards the restoration. The developers were permitted to demolish a brick carriage house near 7th Avenue. As a result of loving care by many owners through the decades, this beautiful home looks like it over did a century ago. The high rise is now located to the east where the postcard shows a peek at the Victorian Inn in the distance. The Rosenfield mansion has been incorporated into Coventry apartments and is used by the tenants. So we thank you Morris Rosenfield for building this mansion. And more thanks to St. Joseph’s and the Sisters of Charity, to the Tri-City Jewish Center, and to Harris-Weber and Coventry for maintaining and restoring it. This article, by Diane Oestreich, is slightly modified from the original that appeared in the Rock Island Argus and Moline Dispatch on October 7, 2001.